It’s been a good last Friday for the AdParlor Pride of Cannes Lions as we see some familiar faces at the top of the tree. Wiliam J Ward and Syed Abdul Karim hang in there at #1 and #2 respectively. Wendy Clark jumps 72 places to #3 – could she be a late winner. See the full Day Six leaderboard. We’ll find out this evening when all the tweets, retweets and @mentions are counted over the course of the whole Cannes Lions Festival of Creativity. It was good to see Cannes Pride being picked up by agencies who are working out one way to win is to get other agency folk to engage with their champion. It’s a good strategy and one that we’ll leverage for next year’s Pride. I thought it might be interesting to look at some of the overall stats in todays analysis. After all, the objective of the Cannes Pride campaign is to promote Cannes Lions through the social media channels of individual lions. The busiest day was Tuesday with (17k tweets) as opposed to Friday’s 6k tweets – perhaps everyone went home. 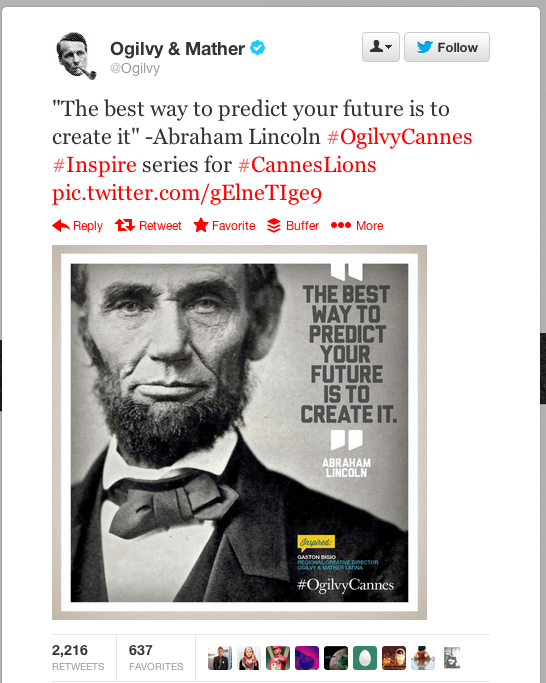 Of the top 3 most retweeted tweets Ogilvy and Twitter pushed the most interesting content. Today I’m doing a bit of in-depth analysis on Panos Sambrakos, Ogilvy Ones’ Executive Creative Director in Athens, and his performance on the Cannes Pride. He possibly doesn’t even yet realise he’s in the Cannes Pride – the AdParlor Top 100 list of digital leaders at Cannes Lions, so well done Panos if this is the first you heard about it. We’ve been tracking Panos’ digital influence over the past four days of Cannes Lions (and that of 25,000 others) to see how effective he is at engaging a wider audience in Cannes Lions content, in particular on Twitter. We’ve crunched all the stats and produced a daily leaderboard. Lets look at his performance in detail. We can see from his past performance that he started with 5 tweets on the Sunday, followed by 1 on Monday, 13 on tuesday and 16 on Wednesday. However his best position (7th) on the leaderboard was on Tuesday (Day Three Leaderboard) because he got 25 retweets and @mentions that day. The leaderboard is ranking players based on how well they do at engaging their audience. On today’s leaderboard – he did less well – down to 31st place – that’s because he only managed to muster 11 mentions and 8 retweets. Not enough to beat the top players in the pride. Check out the Day Four Leaderboard. Well done to Syed Abdul Karim who is now the leader of the pride – he even has added his Twibbon to prove it! David Jones and Adam Bain aren’t far behind though so the contest still has time to hot up. 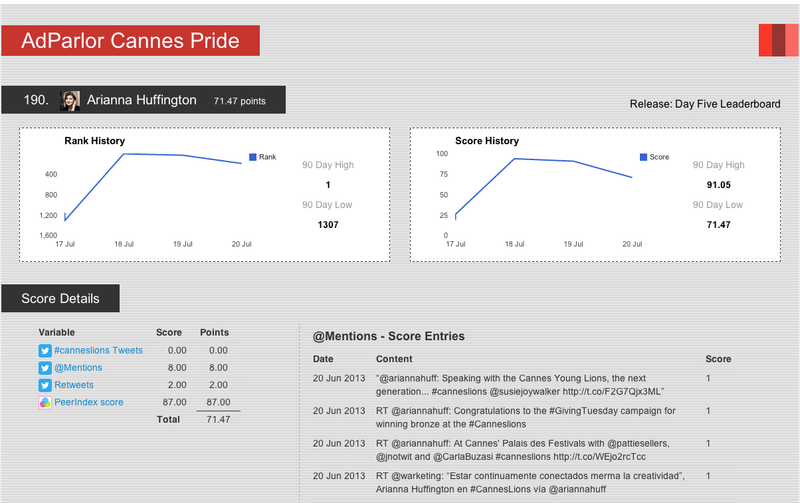 You can join the pride simply by tweeting on #CannesLions and check the leaderboard the following day. If you can’t see yourself in the Top 100 just sign in with your twitter account and you’ll see the leaderboard centred on you. You’ll also be able to check your own in depth stats over the past four days to see how you’re doing. The Cannes Pride leaderboard is about the individual digital leaders. Who will win number one on the Final week’s leaderboard is still very much up for grabs – to win you don’t need to change your behaviour – just keep promoting great content from Cannes Lions and the AdParlor Cannes Pride leaderboard will keep track of who’s really the pride of Cannes Lions! Monday was a busy day for the AdParlor Cannes Pride Top 100 digital leaders at Cannes Lions – 15,771 tweets, 7,277 @mentions and 3,428 retweets by 15,000 players! It’s good to see a couple of newcomers to the top table, we welcome David Jones (up 84) and Arun Sudhaman (up 111 places) to the top of the Pride! Well done too to @RalfVilands1 from H&K in Latvia who climbed a massive 345 places to grab the number 12 spot. Also special mention to two of the pride who I can see have got their Cannes Pride Top 100 Twibbons – well done Adelyn Biedenbach and Syed Abdul Karim. You can now add a Cannes Pride Twibbon to your own profile to show you too are loving the Pride. What a week this is! Together we’ll make Cannes better and better! There’s only a few hours left of Tuesday to engage your audience in #canneslion content – will Amir still be top in the morning?…. stay tuned to find out all the changes in the Cannes Pride tomorrow.